We deal in overhead cranes such as single girder overhead crane, double girder crane, jib crane, gantry crane, semi-gantry crane, underhung crane, monorail crane, curved track crane system, free standing crane system and light weight crane system in Pakistan. The overhead cranes also called electrical overhead travelling cranes or EOT cranes. We specialize in Design, Manufacturing, Installation and Maintenance of overhead cranes. We follow the CMAA & ASME standards for the Design, Manufacturing, Installation and Maintenance of overhead crane. Overhead cranes are of different duties ranging from 1 hour operating time to 24 hours with variable & constant load conditions. We know your requirements according to your process and nature of work. 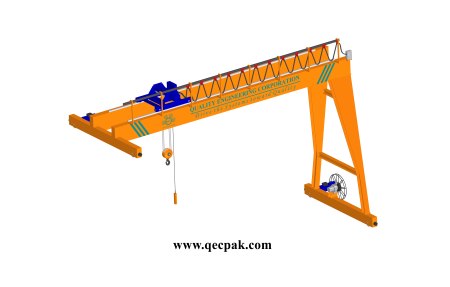 We provide Chinese crane or European crane according to client requirements. The single girder crane consists of single girder fitted on two end carriages. The end carriages are fitted with wheels that travel on the rail by motors. The electric wire rope hoist or electric chain hoist or manual chain block is under hung on the bridge. The hoist reeving is 2/1 or 4/1 depending on the duty of overhead crane. The power supply is 3 phase and amperage depending on the duty and capacity of the overhead crane used. The electrical system consists of PVC Bus Bar or Powerail Enclosed Conductor Bar and Festoon System with Flat Cable attached to the bridge. The control of single girder crane is by pendant control or wireless remote control system. We have single girder overhead cranes ranges from 250 kg to 15000 kg with lifting height from 4 m to 18m with different overhead crane duties. The double girder crane consists of two girders mounted on two or four end carriages depending upon the duty of the overhead crane. The end carriages are fitted with wheels that travel on the rail by LT motors. 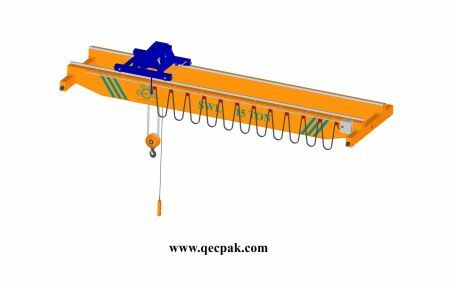 The electric wire rope hoist or electric chain hoist or manual chain block is mounted on the trolley that travel on the upper sides of bridges on a square bar or rail. The power supply is 3 phase and amperage depending on the duty and capacity of the overhead crane used. The electrical system consists of PVC Bus Bar or Powerail Enclosed Conductor Bar and Festoon System with Flat Cable attached to the bridge. The control of double girder crane is by pendant control or wireless remote control system. We have single girder overhead crane ranges from 5000 kg to 250000 kg with lifting height from 4 m to 18m with different overhead crane duties. 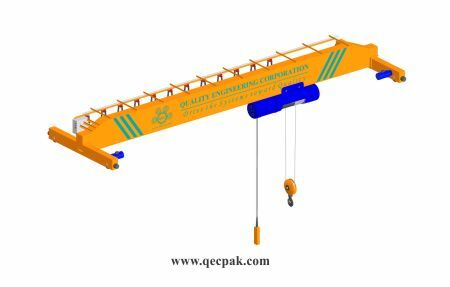 The gantry crane or goliath crane may be single girder or double girder depends upon the capacity and duty of the overhead crane. The bridge of gantry overhead crane installed on its four pillars and the pillars are attached with the end carriages that move with the bridge on the rail. The rail is fitted on the floor level. 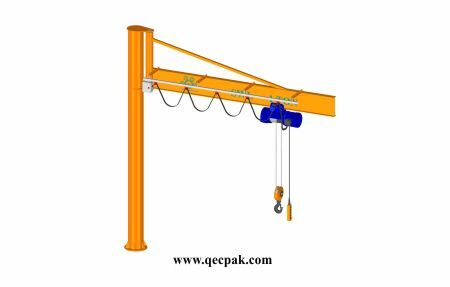 For double girder gantry crane the electric wire rope hoist or electric chain hoist or manual chain block is mounted on the trolley that travel on the upper sides of bridges on a square bar or rail. For single girder gantry crane the electric wire rope hoist or electric chain hoist or manual chain block is under hung on the bridge. The power supply is 3 phase and amperage depending on the duty and capacity of the overhead crane used. The electrical system consists of cable reeling drum and Festoon system with Flat Cable attached to the bridge. The control of gantry crane is by pendant control or wireless remote control system. We have different capacities of gantry overhead cranes ranges from 500 kg to 200000 kg with different overhead crane duties. 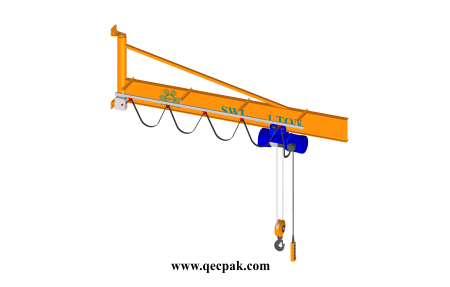 The semi gantry crane or semi goliath crane is a combination of both girder crane and gantry crane. One end carriage of the crane is move on the floor and other end carriage is move on the gantry bridge. The power supply is 3 phase and amperage depending on the duty and capacity of the overhead crane used. 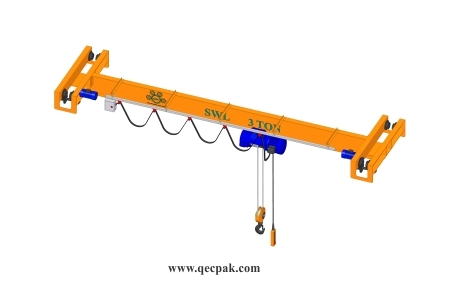 For double girder semi gantry crane the electric wire rope hoist or electric chain hoist or manual chain block is mounted on the trolley that travel on the upper sides of bridges on a square bar or rail. For single girder semi gantry crane the electric wire rope hoist or electric chain hoist or manual chain block is under hung on the bridge. The electrical system consists of cable reeling drum or PVC bus bar system and Festoon system with Flat Cable attached to the bridge. Any electrical system can be use for the long travel of the overhead crane. 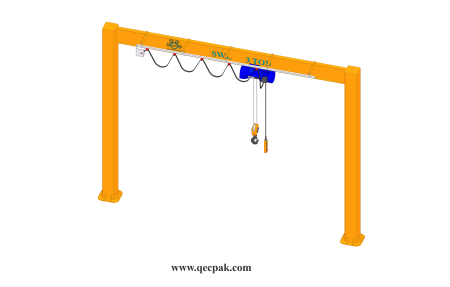 The control of semi gantry crane is by pendant control or wireless remote control system. We have different capacities of semi gantry overhead cranes ranges from 250 kg to 50000 kg with different overhead crane duties. The pillar mounted jib crane is the form of cantilever beam system. The pillar mounted jib overhead crane installed on solid foundation design to bear the load of overhead crane. The jib crane is also called a slewing crane.The electric wire rope hoist or electric chain hoist or manual chain block is under hung on the bridge. The power supply is 3 phase and amperage depending on the duty and capacity of the overhead crane used. 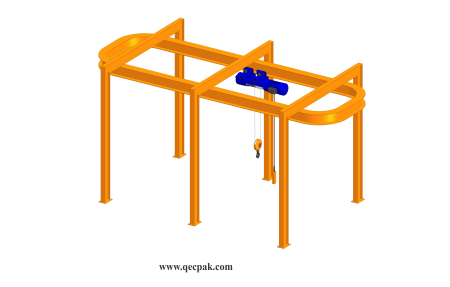 The electrical system consists of Festoon system with Flat Cable attached to the jib arm. The control of jib crane is by pendant control or wireless remote control system. We have different capacities of jib overhead crane range from 150 kg to 15000 kg that rotate about 360 to 180 Degree about it axis and arm length may be 2 m to 8 m with different overhead crane duties. 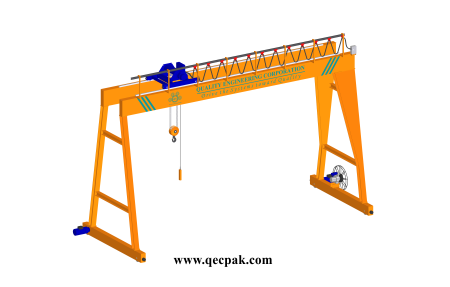 The wall mounted jib crane is the form of cantilever beam system. The wall mounted jib overhead crane installed on side wall or concrete column with bolts. The jib overhead crane is also called a slewing crane. The electric wire rope hoist or electric chain hoist or manual chain block is under hung on the bridge. The power supply is 3 phase and amperage depending on the duty and capacity of the overhead crane used. The electrical system consists of Festoon system with Flat Cable attached to the jib arm. The control of jib crane is by pendant control or wireless remote control system. We have different capacities of jib crane range from 150 kg to 15000 kg that rotate about 180 degree about it axis and arm length may be 2 m to 8 m with different overhead crane duties. The underhung or suspension overhead crane consists of single girder fitted on two end carriages. The end carriages are fitted with wheels that are underhung on the side girders and move by electrical motors. The electric wire rope hoist or electric chain hoist or manual chain block is under hung on the bridge. The hoist reeving is 2/1 or 4/1 depending on the duty of overhead crane. The power supply is 3 phase and amperage depending on the duty and capacity of the overhead crane used. The electrical system consists of PVC Bus Bar or Powerail Enclosed Conductor Bar and Festoon System with Flat Cable attached to the bridge. The control of single girder crane is by pendant control or wireless remote control system. We have underhung or suspension overhead cranes ranges from 250 kg to 15000 kg with lifting height from 4 m to 18m with different overhead crane duties. The monorail overhead crane consists of single girder fitted on two side columns or anchored on the ceiling or fitted on the side walls. The monorail may be curved track girder that installed on the steel structure shed or mounted on the ceiling by anchors. 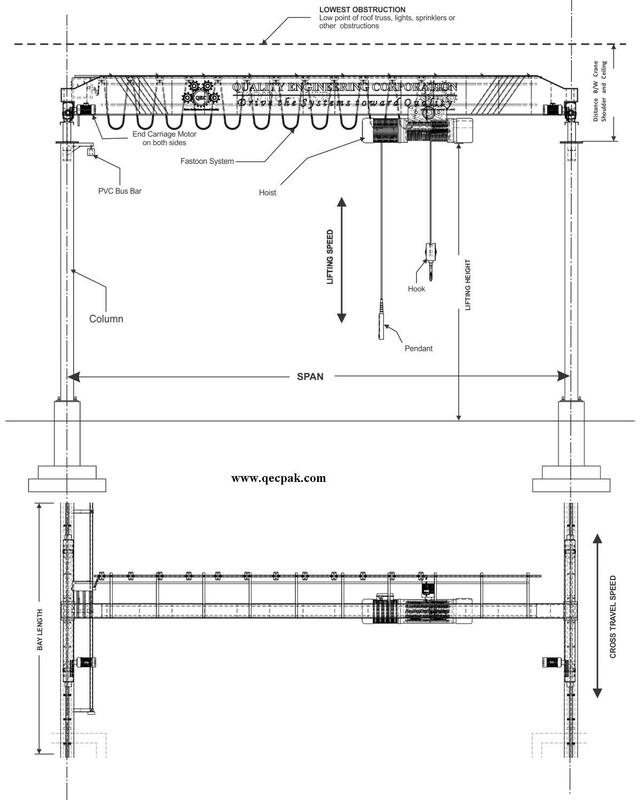 The electric wire rope hoist or electric chain hoist or manual chain block is installed on the monorail girder track. The special curved monorail hoist is used on the curved track girder. The hoist reeving is 2/1 or 4/1 depending on the duty of monorail overhead crane. The power supply is 3 phase & amperage depending on the duty and capacity of the overhead crane used. The electrical system consists of PVC Bus Bar or Powerail Enclosed Conductor Bar and Festoon System with Flat Cable attached to the bridge. The control of single girder crane is by pendant control or wireless remote control system. We have monorail overhead cranes ranges from 250 kg to 16000 kg with lifting height from 3 m to 18 m with different overhead crane duties. The free standing overhead crane consists of vertical columns on which overhead crane installed according to process requirements. The curved track girder, single girder and underhung crane are mostly installed on this system. The special curved monorail hoist is used on the curved track girder. The curved monorail hoist reeving is 2/1 or 4/1 depending on the duty of curved track overhead crane. The power supply is 3 phase & amperage depending on the duty and capacity of the curved track overhead crane used. The electrical system consists of curved PVC Bus Bar or curved Powerail Enclosed Conductor Bar and curved Festoon System with Flat Cable attached to the curved track overhead crane. The control of single girder crane is by pendant control or wireless remote control system. We have free standing overhead cranes ranges from 250 kg to 15000 kg with lifting height from 3 m to 5m. Data Required for Quotation Preparation.